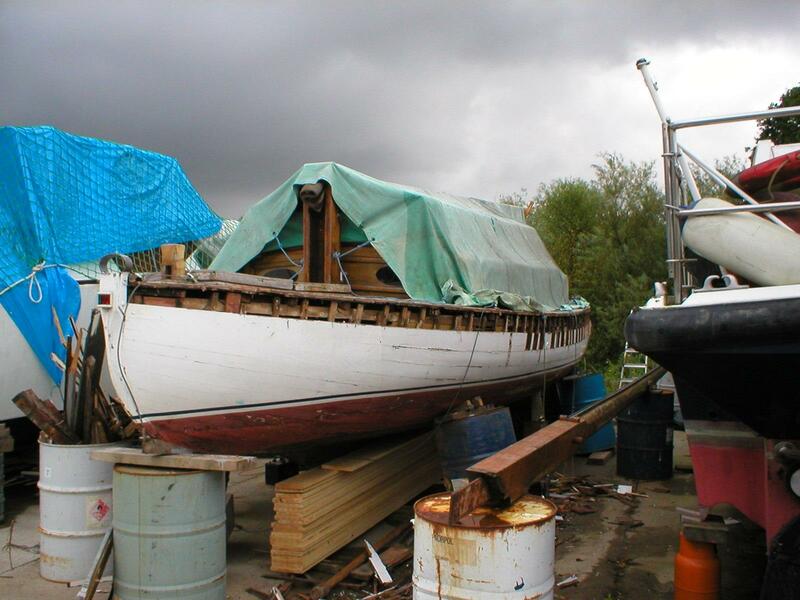 right then I have two of them, one is a 1947 restoration project, which hopefully will be back sailing next April! The other I married four years ago, (thats the brownie points sorted). Now back to the first one. With over two and half thousand members on this forum I was wondering if any of you have had any experience, memories of hiring or sailing on these old Herbert Woods boats? Photos would be great to see also. Although I have a lot of history of this particular class I would like to find out more. It was due to a thread on this forum that I traced Perfect Lady 9, and after subsequently looking over the old girl I decided that the work was not beyond me so decided to take her on. Two weeks down the line all the weight has been removed from the back end, ie Yanmar 10hp inboard, Makuni central heating system, two x 25 gallon fuel tanks, two x 110amp hour batteries and various other miscellaenous items. This lot, combined with lots of short bits of planking have contributed to her nick name of ‘Imperfect Lady’. She had sagged very badly aft and also twisted with the bow over to starboard and the stern over to port. This twist was easy to sort out, and then planks removed and the back end jacked up just over a foot without any noticeable distburbance of the keel! Apart from three hundred foot of new planking, thirty five new ribs, new deck covering and refurbishment of the cabin sides there’s not much else to do! (PS anyone interested in a heating system or diesel engine please pm me) am I allowed to put that in mods? so glad the project is underway! I will trawl through my old photos later, I am sure I have several of her - but they will only serve to illustrate the condition she was in. She will look so much better when you have done the work. No doubt she will sail better too, she was very heavy on the tiller! I found her sedate but pleasant to sail - we didn't often need to reef. Will you leave the bermudan rig or explore the possiblity of a gaff rig? One thing we remember about the yacht is how much comfort there was in the cabin for a relatively short LOD. Separate heads and cupboard too! I would prefer the cooker etc. outside like the Hunters and Japonicas, but that's just a personal preference. We always found the galley area a bit tight and frustrating! Well done on taking on another wonderful project! There are a few pictures of Perfect Lady 1 in the 70s photo gallery of Broadland Memories, and also some of Perfect Lady 7. Adrian (who submitted them) is a member of the forum so hopefully he'll notice this thread and be able to give you a bit more info. I keep meaning to sort through my photo collection and get some stuff to you Carol for your excellent site. I've seen the pics of PL 1 and 7 on there and they really sum up the Norfolk Broads to me. During research I came across a couple of pics, which I can't for the life of me remember where they came from, so I just hope there is no copyright on them. The first shows the actual Perfect Lady I have acquired, number nine out of the ten, probably taken in the 70s, and the other black and white shows the Woods yard full of sailing yachts, and that lovely old railway bridge in the background, probably taken in the 60s judging by the cars. You've certainly got a good project there! Good luck with it. 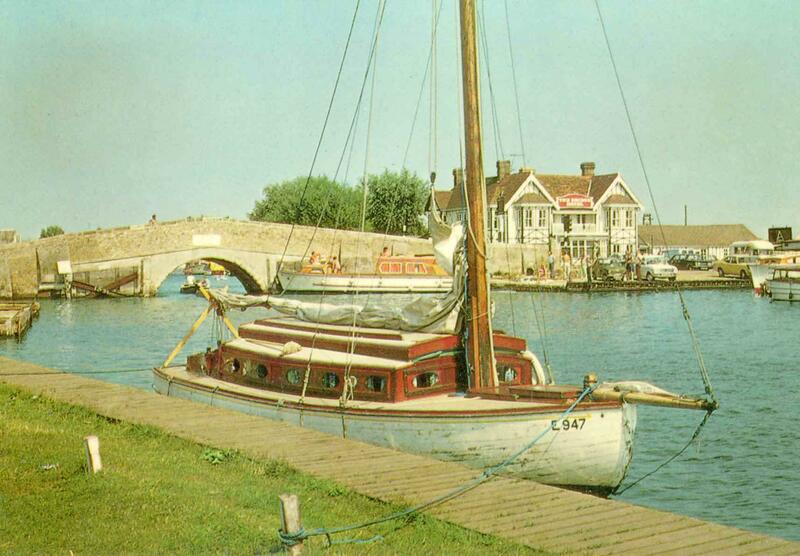 Perfect Lady was my first introduction to the Broads in the summer of 1964. I can't remember which Perfect Lady it was (10?) but it was certainly one of them. It was a school holiday and teens of boats (14?) were hired from Herbert Woods. Each boat held up to six students of all ages - the youngest two slept on the cabin floor on mattresses. The skipper was an ex-student now at university and there was only one teacher for the whole party! The first day was the journey down from the north-west by coach. It must have been an early start because the journey seemed to consist mainly of trying to get through Kings Lynn. In 1964 it was common for that part of the journey to take at least two hours on a Saturday. We arrived with enough time to get through PH bridge and make it up to Hickling where we moored on mudweights and used the dingy to row ashore to the Pleasure Boat. Despite being only sixteen there was no problem in being served – the row back to the boat was interesting. Which one is ours? It must have been a windy week as we managed to get as far south as Beccles and back up to Barton in the time available. 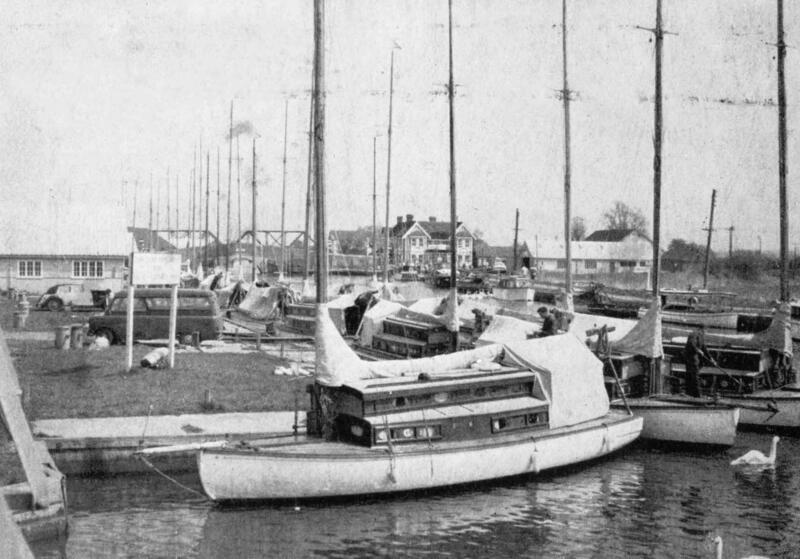 There were no motors on the boats in those days so it was quanting when the wind was foul or blanketed by the trees. The advantage of six on the boat was that you could change personnel frequently and keep up a good speed. With a large group it is rather like being in a regatta every day as I remember. We were all so competitive! The skippers would meet the teacher after an early breakfast and he would decide where we were would be mooring the next night. You had to be there at night but you could get there any way you liked! As choice was limited, it was just an all day race every day. It was a largely uneventful cruise except when the fleet was heading to the Berney Arms. We came down the Yare on the ebb in the evening but the wind was dying and by the time we came to the Yare it had all but gone. The first boat tried to turn up into the Yare but started to go backwards. They had the presence of mind to get one rope ashore onto the rather dilapidated jetty at the junction of the two rivers. The second boat had similar problems and threw a rope to the first boat etc. The outcome was a long line of boats tied to this jetty by a single rope. It was too deep to quant! There was nothing for it but to wait for the tide to turn. We all cooked our meals and ate them, cleaned the boat and waited. It was dark by the time the flood came and we used the dingys to tow the boats across to the Berney. We were all ready for that drink. We had been watching that pub for hours. So near yet so far…. Enough of my reminiscing. I’m now living in Norfolk. Still hiring yachts. I hope I get a chance to see the finished project. Good luck with it. thanks for the story, there is some interesting history in there, for instance the original petrol inboards must have been fitted late in the 60s/early 70s?. Love the bit about all being attached by the one line to the bank! Very happy days, sound similar to my early experiences on the broads with my family. Add To Ignore List From my memories of the 60's, there were two classes of "lady's". The Perfect Lady's had no engine and there was also a number of Leading Lady's, which were slight bigger and had engines fitted. Does anyone know what happened to any of the Leading Lady's?? there were a total of 10 Perfect Ladies, and 6 Leading Ladies. I know one of the Leading was rebuilt up at Wayford a couple of years ago, another was lenghtened, fitted with I believe a 50' mast and renamed Lady Caroline, and raced very successfully, she is now out of the water at Whelptons yard in Upton. Add To Ignore List That B&W shot is fantastic Mat... can you imagine Woods having a hire fleet like that again? Now wouldn't that be good... Well, one can only dream. Looks like my Dad's Bedford mini-bus in the picture too! This is such a good project Mat - and I know I won't be alone in looking forward to seeing PL9 back on the water. There was one for sale on Topsail a while back, but I don't recall the number. I believe it was up at South Walsham.